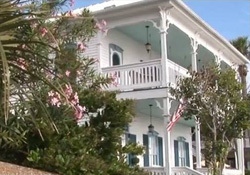 Take an easy breezy bayfront break at Bayfront Westcott House Bed and Breakfast with vintage charm, elegance, and dreamy bayfront location making it the ultimate picture-perfect setting for your get-away. Each guest room is romantically decorated. Exquisit rooms await your visit. Breakfast and Social hour. Click Web Site Below for details, photos and reservations. 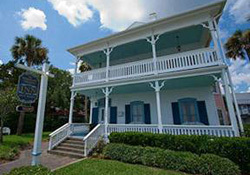 About Bayfront Westcott House "Inn Luxury on the Bay"
Take an easy breezy bayfront break at Bayfront Westcott House Bed and Breakfast. Westcotts vintage charm, elegance, and dreamy bayfront location make it the ultimate picture-perfect setting for your get-away. 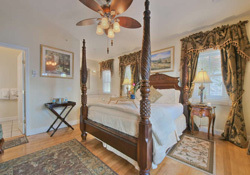 Each guest guest room is romantically decorated with period antiques, most with double Jacuzzis and fireplaces. 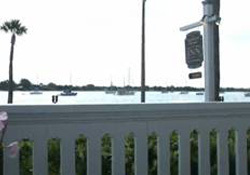 In the morning, enjoy a signature hot entr�e and many scrumptious extras served on the veranda overlooking the bay. Or perhaps you would like to take a more leisurely approach to your day and start out with champagne mimosas and breakfast in bed. We invite you each evening to join us in the dining room for complementary wine, beer, and hors doeuvres. Serenity is yours on our decks and courtyards, and the view from our second-story porch is spectacular. Walk hand-in-hand along the sea wall past the beautiful Bridge of Lions to the historic Castillo de San Marco. Watch shorebirds soar and playful dolphins swim by. Take an easy stroll along the brick-lined streets to the citys historic sites, museums, art galleries, quaint shops, and many fine restaurants. Do not miss out on the fun and romantic packages and free extras. Arrange to have roses, chilled champagne, or chocolate-covered strawberries in your room upon arrival. Enjoy a power lunch made just for you and a guided kayak tour around the bay, and a nice cold beer waiting in your room on your return followed by an in-room massage. Heat fat in frying pan. Saute sausage, onion, garlic, salt, pepper, and paprika until cooked. Mix with thawed hash browns. Spray casserole dish with cooking oil. Spread mixture evenly over dish. Sprinkle half of the cheese over the top. Beat eggs and pour over top. Add the rest of the cheese. Sprinkle with parsley. Oven bake for 45 minutes or until lightly browned.